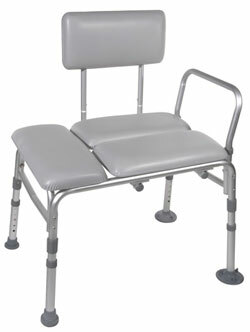 Bath transfer benches are bath seats which are wide enough that two legs can be placed inside the tub and two legs outside. These seats have legs to conform to the difference in the height between the floor of the bathroom and the floor of the bath tub. The idea of a bath transfer bench is that a person who can't step into the tub can sit on the end which is outside the tub, swing or lift their legs into the tub and then slide across. The one drawback of bath transfer benches is that if your bath tub has shower doors, they won't close and if you use a shower curtain, you'll have to drape it over the end of the bench in such a way that the water that runs off the curtain runs back into the tub. While bath transfer benches are height adjustable, some may not be appropriate for the new deeper bath tubs that are becoming more common these days. When purchasing a bath transfer bench it is important the you know the depth of your bath tub. You'll need to know the height of the side wall from the floor outside the tub and the height of the side wall from inside the tub. For conventional 5 foot bath tubs the height shouldn't be an issue. A feature that is common among most bath transfer benches is the ability to be reversible without the use of tools. Because bath tubs can be either "right hand" of "left hand" designs this is an important feature. a right hand tub has the taps and drain on the right when you are standing outside the tub tub looking into it and a left hand tub will have the taps and drain on the left side. While it isn't usual to have to change back a forth between left and right, it is a handy feature should the user move or the transfer bench will be in different places or tubs from time to time. Changing the bath transfer bench from left to right is simply a matter of removing the back rest and reinstalling it facing it the opposite direction. Bath Transfer Bench - The standard bath transfer bench will be adjustable in height, have a armrest that is on the wall side of the tub and a backrest that can be removed and repositioned to face the opposite direction. The actual seat is a hard plastic that some thin people may find uncomfortable. Padded Bath Transfer Bench - The padded bath transfer bench will have the same features that the standard will have but had a padded seat for comfort and to provide some pressure relief. In the pictured model the seat and back are padded with foam and covered with water proof vinyl material. Sliding Bath Transfer Bench - Sliding Bath Transfer Benches are an advancement on the conventional bath transfer benches that make it easier for the user or caregiver to slide the user into the bath tub. Instead of the user having to slide across the bench into the tub the whole seat will slide across on rails. Depending on the model chosen, sliding bath transfer bench seats may or may not swivel or lock at each end of the travel. Tub Mount Sliding Transfer Bench - The Tub Mount Sliding Transfer Benches are ideal for bathrooms that are limited in space. Because the outside legs of the bath transfer bench are replaced by clamps that clamp onto the sidewall of the bath tub, no floor space is taken up and maneuvering wheelchairs and commodes around the bathroom is simplified.